The gong is known as an instrument of transformational power. It is a tool by which we are engulfed in total sound, and through our intuition, we are brought back to optimum health and balance. The gong is a supportive tool for the manifestation of our harmonious physical, mental, and emotional being. The OM(ohm) tone of a gong creates total silence within. The sustained tone of a gong creates timelessness. The building of its tone combinations create a sense of levitation or lightness. It is the unique quality of a gong's resonance that integrates diverse elements into a power of synergy, or functional harmony. We also call the tone produced by the gong a "feeling tone," because we feel it in our body, as well as hear it. This "musical touch," of hearing through the ear of the body itself, creates a sense of ecstasy or well-being. The gong experience is an immersion into a spiraling cocoon of total sound. Through gonging, we are able to lose the sense of identity with our body as a physical object. We are no longer limited to a 3rd dimensional material world, but are taken to a fourth dimensional dreambody. sciousness and our more evolved innate intelligence. Our innate intelligence is the consciousness, creating perpetual DNA-repair while we are alive. Although this repair goes on while we are in the awake state (beta consciousness), it is when our rational mind is asleep that the DNA-repair is better able to achieve maximum efficiency. This process begins in the alpha-theta state and reaches ultimate efficiency in the deep delta state. In delta-sleep, the mind is completely unconscious. In the completely meditative state of being awake while completely asleep (the 4th dimensional gong experience), we increase the re-youthing potential of the innate intelligence without going into unconsciousness. The personal ego is then able to attain a state of non-judgement or neutrality. This is the state of total body/mind harmony. The essential key to the gong's force of resonance, and its effectiveness, is the complete submersion and saturation of a person in layer upon layer of tone-cell multiplication. The universal gong sound is based upon the musical principle that all tones of equal amplitude keep resonating, adding to themselves, to produce cumulative offspring, so to speak. This is a phenomenon unique to gongs and replicates exactly what happens in the building of the human physical, mental, emotional and spiritual bodies. 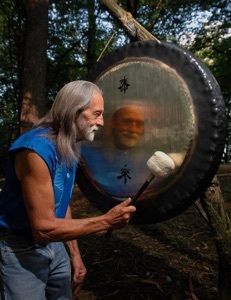 Don Conreaux is a pioneer in the use of the gong for stress reduction, healing and personal transformation. He travels extensively presenting the ancient gong as a symbol for sound healing in the 21st Century.